There’s something to be said about really nailing a hyper-specific aesthetic, and that thing is “cool.” Acid Spy has buckets of cool; it’s oozing the stuff. 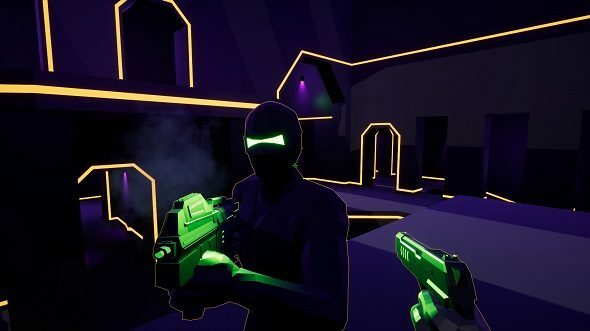 Part cyberpunk stealth game, part stylistic throwback, Acid Spy is about James Bonding your way through a Tron-like world of neon lights, guards, and laser beams. And you do it with a kind of almost Quake-like speed. The premise is pretty simple: You’ve got to sneak through levels and eliminate hostiles without being seen. You accomplish this by shooting cameras and guards, using parkour to leap from pillar to pillar high above the floor, and knifing enemies as you plunge down from above. Here’s our list of the best indie games to play on PC. The action takes place in dark, stark levels lit by bright neon that highlights level geometry. In addition to making Acid Spy look like a laser tag arena from the 1980s, it helps keep the game’s ludic elements right in the foreground. Guards’ eyes are covered with cool neon visors that helpfully indicate where they’re looking, for instance. The look is heavily reminiscent of Far Cry: Blood Dragon’s blazing pinks and blues against black, but in Acid Spy you get a more fully ray-traced look. But zipping around knifing guards and dropping through laser spirals in a highly stylized, minimalist environment also reminds me of Super Hot. Acid Spy launched June 8th and thus got a bit lost in the flood of E3 coverage that was just getting ramped up at the beginning of the month. I haven’t had a chance to get any hands-on time with it yet, but I’m definitely sold on the aesthetic – including the bright synthwave soundtrack, which was done by Wolf and Raven.